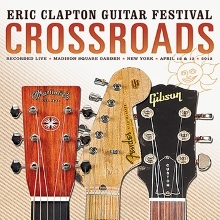 Having been fortunate enough to attend both nights of Eric Clapton‘s Crossroads Guitar Festival this spring, we’ve been eagerly awaiting the highlights DVD that customarily follows, scheduled for release next Tuesday. For the first time, some of the music will also be available as a two-CD set, a nice thing to have, at least until you get the chance to watch the two DVDs, which contain all 29 songs from the CDs plus 16 others, among them, Booker T., Steve Cropper, Keb’ Mo’, Blake Mills, Matt “Guitar” Murphy and Albert Lee performing Albert King’s “Born Under a Bad Sign”, Clapton and Andy Fairweather Low on Low’s “Spider Jiving”, Robert Cray, B.B. 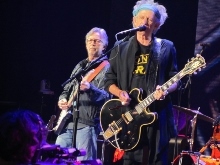 King, Clapton, and Jimmie Vaughan on “Everyday I Have the Blues”, Clapton with Kurt Rosenwinkel on Tommy Johnson’s “Big Road Blues”, Taj Mahal and Keb’ Mo’ joining up for “Walkin’ Blues”, and Jeff Beck and Beth Hart on Freddie King’s “Going Down”. Looking back over our notes from the festival, we have to say that the folks at Rhino Records did a nearly perfect job of capturing all of the weekend’s biggest moments, from that early offering of “Born Under a Bad Sign” and the “Green Onions” that followed, John Mayer and Keith Urban‘s take on The Beatles’ “Don’t Let Me Down”, a rare solo acoustic performance from Gary Clark Jr. with “Next Door Neighbor Blues”, and Buddy Guy, Robert Randolph, and Quinn Sullivan on “Damn Right, I’ve Got the Blues”, to Clapton joining the Allman Brothers Band for “Why Does Love Got to Be So Sad”, John Mayer and Doyle Bramhall II doing Bramhall’s father’s “Change It” (written for Stevie Ray Vaughan), Gregg Allman, Warren Haynes and Derek Trucks with an acoustic cover of Neil Young’s “The Needle and the Damage Done”, Vince Gill, Keith Urban and Albert Lee taking on the Rolling Stones’ “Tumbling Dice”, Taj Mahal and Keb’ Mo’ on both “Walkin’ Blues” and “Diving Duck Blues”, Clapton and Keith Richards on “Key to the Highway”, Andy Fairweather Low and Clapton on “Gin House Blues”, Beck and Hart’s “Going Down”, and Clapton’s rousing “Got to Get Better in a Little While”, in addition to appearances from Sonny Landreth, Earl Klugh, and Los Lobos, among others. From the blues perspective, there were of course several other songs we would have loved to also see captured on the DVD, including the festival opening “Drifting Blues” from Clapton; Cray and King trading vocals on “Sweet Sixteen”; Taj Mahal both on harmonica and sharing vocals with Gregg Allman on an Allman Brothers Band performance of “Statesboro Blues” that also included Los Lobos guitarists David Hidalgo and Cesar Rosas; Guy, Randolph and Sullivan with “Someone Else is Steppin’ In”; Keb’ Mo’ and Taj Mahal with “That’s Alright”; and Beck and Hart’s cover of “I Ain’t Superstitious”, but one can hardly complain when so many of these artists are already pretty fairly represented on the DVD. Perhaps the most disappointing omission, however, is that of Los Lobos with Robert Cray on vocals for Jimmy McCracklin’s soulful Stax-era “Just Got to Know”, over which the producers apparently instead chose the band’s “I Just Got to Let You Know”, also featuring Cray (although we’d be lying if we said that part of us isn’t secretly hoping it’s a mislabelled track and that the McCracklin cover shows up instead). Either way, it looks like this Crossroads DVD (and CD) set will be another well worth adding to your collection, with plenty of good stuff to see and hear. And for those looking to either catch up to the 2013 edition or revisit some favorite performances from past years’ festivals, we can’t think of a better way to get in the mood for next week’s Crossroads releases than by tuning in to Palladia this weekend, where they’ll be running highlights from Clapton’s 2004, 2007, and 2010 festivals throughout both Saturday and Sunday. This entry was posted in Albums, Movies and tagged Albert Lee, Allman Brothers Band, Andy Fairweather Low, B.B. King, Beth Hart, Blake Mills, Booker T., Buddy Guy, Cesar Rosas, Crossroads Guitar Festival, David Hidalgo, Derek Trucks, Doyle Bramhall II, Earl Klugh, Eric Clapton, Gary Clark Jr., Gregg Allman, Jeff Beck, Jimmie Vaughan, John Mayer, Keb Mo, Keith Richards, Keith Urban, Kurt Rosenwinkel, Los Lobos, Matt "Guitar" Murphy, Quinn Sullivan, Robert Cray, Robert Randolph, Sonny Landreth, Steve Cropper, Taj Mahal, Vince Gill, Warren Haynes. Bookmark the permalink.